There’s no doubt that we’re now living in the era of flexible working. Of course, for contractors and freelancers, this trend of choosing how long, where and when you work is nothing new, but now it’s not just the self-employed who are empowered to manage their schedules. In the UK, nearly-two thirds (64%) of employees now work flexibly, according to the ‘2017 Flexible Working Survey’ by Ten2Two. However, it seems that employers are still a little reticent to fully embrace the flexible working revolution, with Timewise’s 2017 report revealing that less than one in ten jobs paying over £20,000 are advertised as being open to flexible working. Organisations are concerned that giving everybody a degree of freedom in deciding how work is completed will result in reduced productivity for both individuals and teams. Even if employees are just 5% less productive working remotely, it’s going to start adding up once you think about it collectively. Meanwhile, for those who are self-employed, a day of distractions at home could mean that you have to play catch up at the weekend. Flexible working sounds good in practice for individuals, but the reality can be very different. For some people, too many consecutive days working solo can lead to feelings of isolation, particularly if communication with the ‘outside world’ is lacking. A good support network is essential so that individuals don’t feel like they have nowhere to turn should they need to. Meanwhile, from an employer’s perspective, a lack of collaboration between colleagues could limit the cohesiveness of teams and the sharing of ideas. 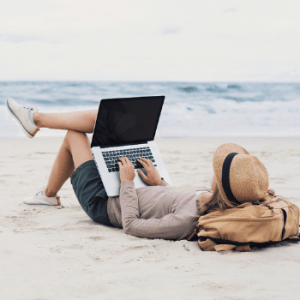 Flexible working often blurs the line between work and home, to the point where individuals struggle to switch off at the end of the day – an issue all contractors and freelancers who work remotely wrangle with. For the sake of work/life balance and productivity, individuals need to feel like they can pack work away for the day and not like they owe it to their company to go beyond the call of duty every day. Perhaps the benefit you most associate with flexible working is the ability to work remotely, away from the traditional office environment; be it at home, in a cafe, library, shared space, or even in a foreign country. Find the environment that brings out the best in you – if that’s at home, make sure you ‘craft’ in a way that means you can get stuff done. Workplace politics can be a real problem if they are rooted in manipulation or gossip. Flexible working can help to minimise office politics, so the potential for conflict and any resulting occupational stress decreases. As stress decreases, so will the number of sick days employees take in the working year. This has obvious benefits to employers in terms of greater productivity, but it’s also valuable for freelancers and contractors who might have to forfeit a day or two’s work if they’re too sick to get out of bed. Everybody has different priorities in life. For some people, their children will be the priority; for others, it might be sports and keeping fit. Flexible working gives us a better chance of being successful at what matters most to us. For example, having a flexible schedule means you can take an hour out to pick up the kids from school and do the food shopping. Ultimately, flexible working works for some people, but others may need a bit more structure. If you’re considering a flexible approach to work and think contracting is for you, Intouch Accounting are here for support by answering any questions you may have, from assessing whether it’s the right time, to helping set up a Limited Company.